One hundred and sixty-four years after Richard Trevithick's Penydarren locomotive first proved that steam could successfully move wheels along rails, time runs out for the most endearing of man's industrial inventions. It is August 1968 and steam is very near the end of the line. For a decade it has retreated on all fronts like a defeated army, and now the survivors are dug-in across the North West of England awaiting their last stand. Fittingly it is the workhorses which remain while the thoroughbreds have already gone to the cutter's torch or - if they're very lucky - to painted preservation. 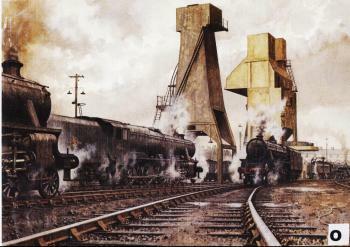 Here at Carnforth in Lancashire, one of the last steam depots, the grimy unsung sloggers of the steam era perform their final ablutions in the shadow of the ash plant and the coaling tower. Nicknamed 'cenotaphs' by railwaymen these concrete obelisks already look ominously like memorials to a bygone age. Inevitably it is examples of Stanier's Class 5MT 4-6-0 and 8F 2-8-0 that are still at work. Once they were two of the most numerous types of locomotive on BR, and as late as 1959 all 666 8Fs and all 842 Black Fives were still in service. The slaughter of steam in the 1960s has been a holocaust. Real steam finished on BR during the weekend of 3 and 4 August 1968. The final regular standard gauge service train ever to be hauled by a steam locomotive was the 21.25 Preston to Liverpool on the Saturday. Packed to the doors with mourners, it turned out to be a sprightly wake as Class 5MT 4-6-0 No. 45318 was worked up to 78mph at one point. The following day a procession of enthusiasts specials chased each others' tails around similar itineraries in the North West, most of them losing time hand over fist as they did so. A week later on Sunday 11 August BR ran its own 'End of Steam Commemorative Special' costing what was at the time considered to be the exorbitant fare of 15 guineas. And that was the end of steam on BR. For a while anyway. For a couple of years there was a complete ban on steam movements on BR; an interregnum which reinforced the break between the old era and the new. By the early 1970s, however, privately preserved steam locomotives were allowed back over certain routes once the considerable problems of feeding and watering these hungry beasts in a system now fully diesel or electric had been resolved. Today, a market-led BR operates a variety of steam services itself, hiring back locomotives it once owned. As well as summer trains on scenic lines InterCity runs "The Shakespeare Limited" Sunday luncheon special between Marylebone and Stratford-upon-Avon: a day out with a difference where steam whets the appetite for the traditional 3-course Sunday lunch and afternoon tea. When a group of Italian prisoners of war began work on the new locomotive depot at Carnforth in 1942, they could scarcely have guessed they were laying the foundations for a future major tourist attraction. Now it is Steamtown Carnforth, a working museum demonstrating that the steam locomotive - like so much else of Britain's industrial heritage - is just another part of the entertainment business.